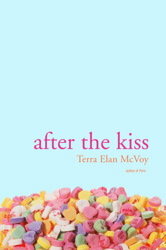 Today is the release day for Terra Elan McVoy's After the Kiss ! 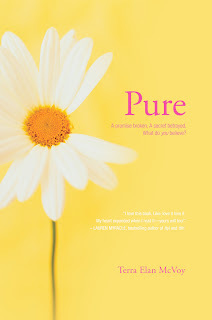 I just adored Terra's first book, Pure! (Which, by the way, is now available in paperback!) Both of her books are really great ones that you'll want to pass long to all of your friends! To celebrate the release, Terra was kind enough to answer some of my questions, and thanks to Simon and Schuster, you'll have the chance to win copies of After the Kiss--one for you, and one for a friend! Becca is just another high school senior, counting down the days to graduation and college and passing her time with her boyfriend Alec, the one guy that truly gets her. Camille has been dragged across the country and back again multiple times thanks to her father's job, and she's miserable in her new Atlanta home. Thoughts of her old home in Chicago—and the boy she left behind—won’t stop haunting her. Camille doesn't know Becca, but she gets to know Alec...and when they share a kiss that Becca's best friend witnesses, neither Becca nor Camille will ever be the same again. Terra Elan McVoy's striking second novel examines the power of one kiss and its many ramifications. After the Kiss alternates between the points of view of the two characters: Becca's perspective is told in many lovely, inventive, and diverse poems that are fun to read and showcase McVoy's talent nicely, while Camille's portions of the story are more emotionally grabbing. They are in second person, and she lacks capital letters. This style is unusual, but it embodies Camille's confusion and her detachment as a coping mechanism perfectly. Though the girls have very few physical encounters throughout the book, their stories flow together seamlessly. Becca's new job, which forces her apart from Alec, helps her mature and the experiences she faces help her to obtain the confidence she needs to talk openly with her mother and plan for her future. In a world where everything is interchangeable--homes, schools, friends--Camille wanders around without any sort of purpose, but she finally learns to open up to others and slowly comes to the realization that goodbye for now doesn't necessarily mean goodbye forever. Each girl's journey is entertaining and profound, and the best part is that McVoy doesn't force you to take sides. Instead, she demonstrates that people are never what they appear to be, despite their actions and what little information you may know about them. After the Kiss isn't so much about romance and Alec as it is about growing up and all the problems and triumphs that come with that process: figuring out your own problems, coming up with the appropriate solutions, and making peace with others. This is an extraordinary novel about letting go and holding on that you won't easily forget. Cover Comments: Though this cover gives you the impression that the book will be lighter and more romantic than it really is, I love it! The pink on blue is very pretty, and I like the how the candy hearts and the title all gravitate toward the bottom of the cover. It's a very fresh, neat effect! TCR: How did the idea for After the Kiss evolve? Did you know from the very beginning that you wanted to write a novel in verse? TEM: After I was finished with Pure, I got antsy to start something else but didn’t know quite what to focus on. I was talking with my editor, and she was tossing out some ideas she’d thought I might be interested in, and one idea was a novel in verse. She had some other ideas too (including something involving a love triangle), but that verse thing stuck with me, since my background is in poetry. So, about a half hour later I was suddenly bubbling with this idea of writing a book from three different perspectives, using three types of poetry to distinguish the voices. I got up, started writing things out right away (which to me is a sign the book’s going to happen). Things got modified a bit, but that’s where the book came from! 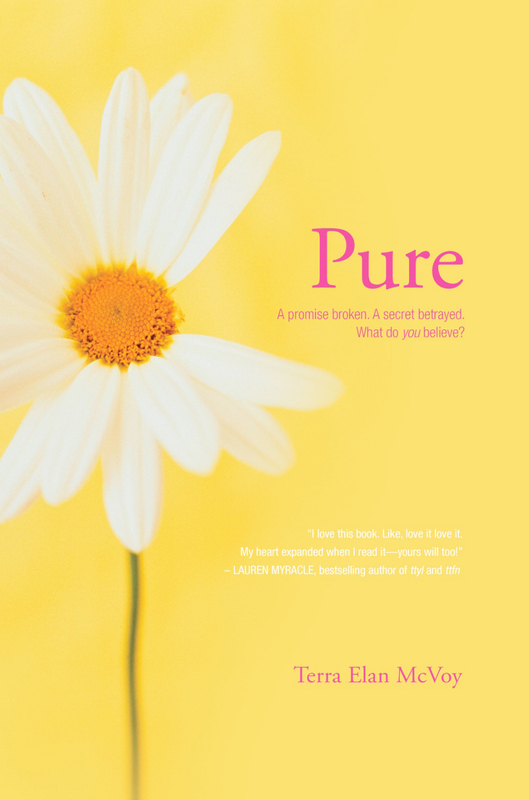 TCR: After having published a novel in verse and one in prose (Pure), is there a style you prefer, or does it depend on the story? TEM: I think it really does depend on the story, and the characters. I’m not sure all tales can be well told in verse, because it’s a very interior and character-centric format. And, to me, because Becca and Camille are so strong and distinct, I feel like it might be hard to write another novel in verse any time soon, without duplicating their voices. So, while I really, really enjoyed this format a lot, I may be sticking to prose for a little while. TCR: After the Kiss alternates between the points of view of Becca and Camille; did you enjoy writing from one character's perspective more than another's? TEM: It was really fun playing between both of them. I would write for Becca for awhile, and then would need to get Camille caught up to where we were, and that was neat, going back and forth between their brains. The girls are such perfect foils for each other—one is strong where the other is weak, and vice versa, so there was this constant feeling of balance for me. Camille was a little harder to get to know (which I thought was funny, because that’s her personality in the book), but I like both girls so much that it was really a pleasant experience! TCR: What are your writing essentials? TEM: I’m fairly easy, really. I do most of my generating on my laptop, but I do also do a lot of pre-writing and freewriting in notebooks. I have to have a lot of structural background planning, too. Like, for Pure I had to figure out the girls’ school schedules and write out a calendar of when things happened for whom, when Morgan had dance practice and things like that. Same with After the Kiss—there’s a lot of sort of logistical stuff I have to have for myself so that everything makes sense. At home while I write I play music, of course (for After the Kiss I listened to a lot of Neko Case), and usually have some water nearby, but I don’t have any special chair requirements or anything like that. TCR: Have you read any books lately you'd like to recommend to your readers? TEM: I’m actually really behind on my reading right now, which is a total shame for me! But I am reading How to Say Goodbye in Robot by Natalie Standiford, which I’m enjoying a lot, and I thought John Green and David Levithan’s Will Grayson, Will Grayson was just perfectly delightful. 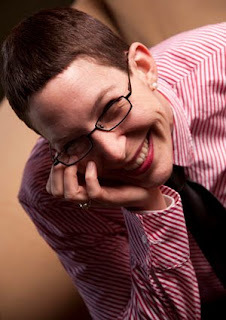 Adrienne Vrettos’ The Exile of Gigi Lane is also hilarious, and a book everyone should be really excited about is Accomplice, by Eireann Corrigan, which is coming out in August—it is so astonishingly good. TCR: What can we look forward to next from you? TEM: Haha. How did you know there was another project in the works? I do have a book I’m working on for 2011, but I’m not really talking about it yet, because not even my editor has seen it! I just hope people will enjoy reading After the Kiss for now, and will let me know what they think! Now...contest! All you have to do to enter is fill out the form below, and tell me who you would give a second copy of After the Kiss to! Your best friend? Sister, cousin? Let me know, and you'll be entered to win! This contest will run through May 21st, 2010! Awesome giveaway! Loved the interview. I definitely want to read this book. Sounds like a great plot and I love novels written in verse. Awesome interview! Her writing schedule is a lot like how I would do it! Loved the interview and I can't wait to read this book!